ECO saddle-stitched 2011 pocket planner with 13pt soft matte laminate finished interior cover and 56 ivory sheets made with 100% recycled material. The printed sheets and covers are colored with organic based inks. 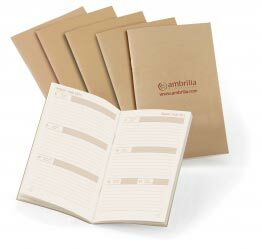 Inside each pocket planner are perforated corner page markers, a personal information section, 12 month week at a glance layout, 2011 & 2012 calendar layouts,as well as a lined page for note taking. North American holidays are listed. MADE IN CANADA. (Also available in Engish only). Orders will begin shipping on Nov.1st,2010. Product Size : 3.5" x 6"
Imprint Size : 2.25” x 1.5"